Today is September 2 and that means Oktoberfest is only a few weeks away! Since this is a time when many people come and visit this fair city, I felt like it might be good to do a post about drinking beer and what to expect. 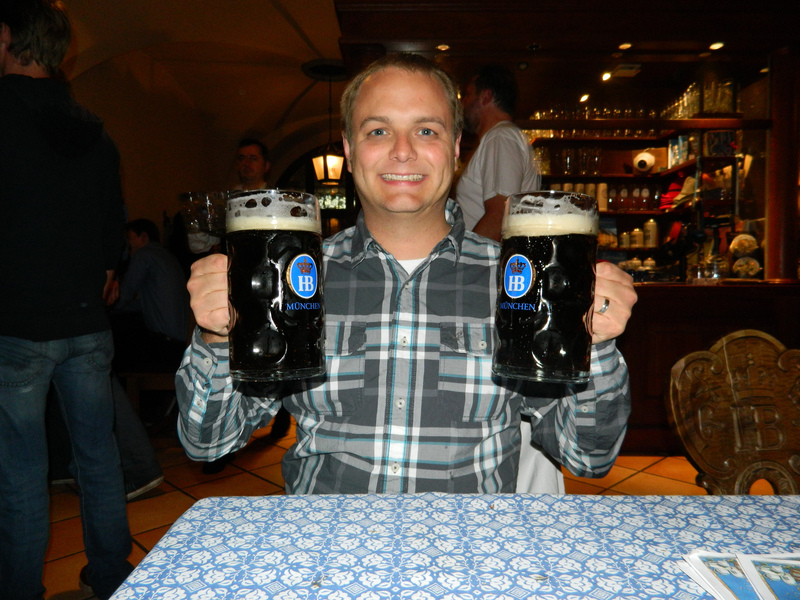 For those of you who have never been to Germany, and more specifically Munich, this post is for you. For those of you who have, this post is not for you but you are welcome to chime in and tell me where I am wrong and what I have missed because you know that its bound to happen. Most of the time, you have two beer choices in this city and that is Helles or Weissbier. Helles essentially means light beer – in color, not calories (I haven’t gained a few kgs since moving here for no reason). Weissbier is a wheat beer and is also fairly common. Some places may have a Dunkel (or dark) beer and seasonally, you may also find Maibocks and Starkbier, but in general, expect to drink a Helles. It’s delicious. You’ll be fine. If beer isn’t your thing but your friends drag you to a biergarten with a limited menu, one option you have is to order a Radler, which is a shandy or a mix of half beer and half lemon-soda. I tend to drink these a lot because they are a good way to have a beer without feeling the effects too soon. They were invented by the Germans so that they could drink their beer and still be okay to bike home (the German word for cyclist is also Radler…Learn something new every day). Plus they are hella refreshing on hot summer days. Unless you order a Weissbier (which only come in one size), you can typically order a halb (half-liter) or a Maß (liter, pronounced like m-AH-s). The Maß is sometimes the only option at biergartens, which makes me sad. I understand that this may be perplexing considering how cool one looks drinking out of a gigantic stein and how good of a workout it is for your biceps but hear me out. 1) It’s freaking heavy and I have no upper body strength 2) It’s A LOT of beer at once, as it is equivalent to roughly 3 normal American beers and 3) If you don’t drink it fast enough, it gets warm and gross. So your options are to either drink fast (quickest route to drunk city) or waste beer (not an option). So heavy, I literally have to support it with my other hand. The top rules of cheersing are: 1) Say ‘Prost’ 2) Prost with every single person in your group and 3) Look the person you are cheersing in the eyes (very important). There are other rules, such as you tap the bottom of the glass of those drinking Weissbier, but these are the important ones. Also, when you hear the song, Ein Prosit, and you will hear it, it is required to cheers with your neighbors. Do it. Even if it’s the 893rd time they have played it…which will happen. Here are the lyrics. Learn ’em. Listen, Germany is not going to serve you beer in a plastic cup or crappy pub glass. They are going to serve you in a proper glass, mug, or stein. Naturally they want these back so expect to be charged a small fee on top of the beverage price. This fee is called a Pfand and when you return the glasses, you get your money back. Look for the signs that say Pfand or Rückgabe or some combination of the two. It is important to note that they do not charge Pfand at Oktoberfest but this does not mean you get to keep the glass. It is not wise to try and sneak one out in your purse. I’m totally not speaking from experience on this one… …. …. For biergartens, always bring some ‘klein geld’ or small change with you because 99.999999995% of the time there is a bathroom attendant. Some festivals charge specific amounts and other places leave it up to your discretion. So just always make sure you have some change. Bring lots of cash money. Beers are expensive at 10€ a pop and they do not take credit card. Be sure to have some extra dough on hand for food (keep reading) and rides/games outside the tent. Don’t Tent-stress. It’s important to be aware that the Hofbräu tent is notorious for being the touristy one. And while it’s true that some tents are better than others, you will probably have a good time wherever you are so do not stress too much over the tent. Just find one where you can get a seat, order ‘ein Bier’ (or zwei if you are feeling frisky), and enjoy. Pace yourself. 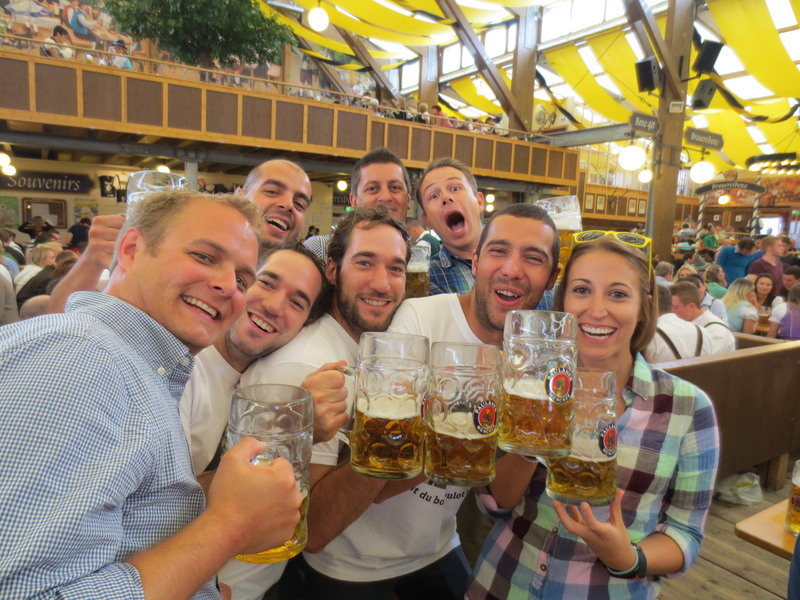 Oktoberfest beer is stronger than regular beer and when downing liters at a time, its easy to overdo it quickly. Also a side note for my chuggers out there. I personally do not recommend chugging a Maß but every year, without fail, guys (girls are smarter than that) will stand on top of the table to chug for everyone to see. If you choose to be one of these guys, be sure to finish. If you do, you will be met with rousing applause and cheers. If you don’t, Germans will not only boo the hell out of you but will also throw food at you. True story. Have a good food base. Eat something before and during your time there. And by something, I do not mean just a pretzel. I know this is just a basic binge-drinking rule but it really applies here. Its really really easy to forget to eat when you are having so much fun. But trust me, EAT. This was all I ate at my first Wies’n… it ended with the murder of the feather in that hat and really bad Chinese food. Local friends, please feel free to comment below and provide more tips and/or amendments to the list above! The Australian Consulate in Munich used put out a desk in their front office during Oktoberfest just to deal with drunken Australians that lost their passports and needed an emergency travel documents to get home.